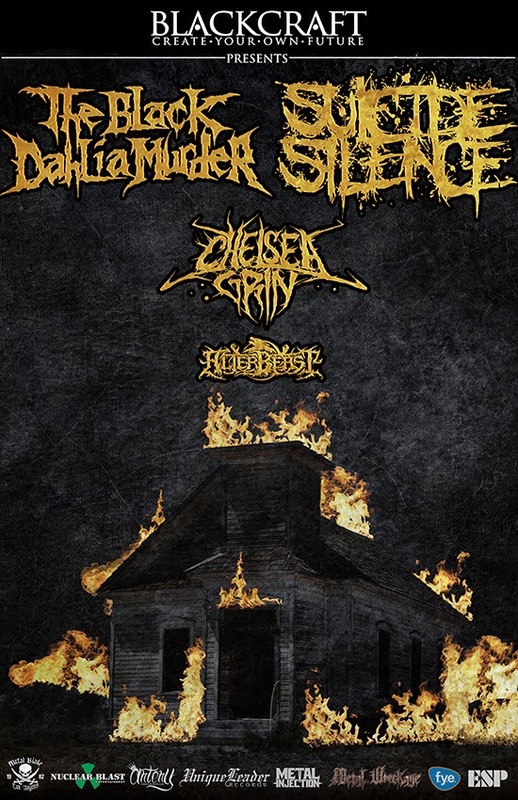 Metal Messenger - Metal & Hard Rock News: SUICIDE SILENCE AND THE BLACK DAHLIA MURDER ANNOUNCE N. AMERICAN CO-HEADLINING TOUR! SUICIDE SILENCE AND THE BLACK DAHLIA MURDER ANNOUNCE N. AMERICAN CO-HEADLINING TOUR! California based extreme metal titans SUICIDE SILENCE, and Michigan's unstoppable sons of molten melodic death metal, THE BLACK DAHLIA MURDER, will combine forces this Fall on a heavy metal campaign across North America presented by Blackcraft! Joining them are Salt Lake City deathcore merchants CHELSEA GRIN and Sacramento based tech-death proprietors ALTERBEAST. "It has been way too long since we headlined in the good ol' US of A and it's an honor to be co-headlining with our friends in BLACK DAHLIA," comments SUICIDE SILENCE guitarist Mark Heylmun. "It doesn't matter how long your hair is, what your girlfriend looks like, or if you make it into work the next day… Come out and party with us!!" THE BLACK DAHLIA MURDER vocalist Trevor Strnad adds: "We are very excited to finally be able to let the big secret out… our final US tour on the Everblack album will be with none other than California titans SUICIDE SILENCE. The guys have been homies of ours since we toured together with CANNIBAL CORPSE in South America. We are extremely glad they've chosen to persevere all of the hardship and tragedy and we are proud to call them tour mates and friends. The magic 8 Ball says we're going to party our asses off together and have an awesome, successful tour. Cheers to SUICIDE SILENCE and we'll see you all in October!"